Monitor order statuses and exceptions. View orchestration orders and orchestration processes. Identify fulfillment lines and orchestration processes with exceptions. View orchestration process status using a Gantt chart and visual alerts for tasks in jeopardy. Check item availability, including a variety of options and their costs and delivery dates. Use embedded intelligence for decision making. Take corrective actions, such as substitute an item or split lines, so that supply can be sourced from multiple warehouses. Oracle Fusion Distributed Order Orchestration business objects work together to enable you to monitor, manage, and fulfill orders efficiently. This topic discusses the business objects and their relationships. This figure shows what happens to the structure of a sales order when it enters Distributed Order Orchestration. In this example, a sales order with four sales order lines enters Distributed Order Orchestration from the order capture system. After decomposition, the sales order becomes an orchestration order with four orchestration order lines. The first orchestration order line has one fulfillment line, which is associated with one orchestration process. The second orchestration order line has two fulfillment lines, both of which are associated with another orchestration process. The third and fourth orchestration order lines each have one fulfillment line, both of which are associated with a third orchestration process. When Oracle Fusion Distributed Order Orchestration receives a source sales order, it decomposes the order into logical pieces that can be fulfilled. The primary component is an orchestration order, which comprises orchestration order lines and fulfillment lines. During decomposition, the sales order may be broken down into a different structure, so the resulting orchestration order might not exactly mirror the original sales order. An orchestration order contains orchestration order lines. This relationship is like the relationship between a sales order and a sales order line. When you want to act on an orchestration order, you do so by taking action on the fulfillment lines that are part of the orchestration order. An orchestration order comprises one or more orchestration order lines. An orchestration order line usually has one fulfillment line. When a fulfillment line is split, two or more fulfillment lines map back to the same orchestration order line. The relationship between orchestration order and orchestration order lines preserves some of the original structure of the sales order, making it easier to keep track of the original intent of the order, even when fulfillment lines associated with orchestration order lines are split. A fulfillment line represents a request for product to be fulfilled. It contains important information about the request, such as customer, order, item, quantity, scheduled ship date, actual ship date, and shipping method. A fulfillment line is the main business object that you act on in the Order Orchestration work area. You can schedule or unschedule a fulfillment line; reserve product for the line; substitute an item on the line; change the warehouse, shipping method, or demand class; and other such actions. A fulfillment line is assigned to an orchestration process, which carries out the necessary set of tasks to fulfill the line. Most orders are new sales orders, but some are for product returns. Fulfillment lines represent new orders. Return fulfillment lines represent orders for product returns. An orchestration process is a defined set of tasks, their sequence, and dependencies required to fulfill one or more fulfillment lines. Orchestration processes include user tasks, such as activities, and automated tasks, such as scheduling, reserving, shipping, returning, and invoicing. Orchestration processes are defined during setup, at which time an order administrator determines the tasks needed to complete an orchestration process. In the Order Orchestration work area, you cannot change the orchestration process definition, but you can see the progression of a fulfillment line through the orchestration process. This visibility enables you to see where in the orchestration process a fulfillment line is. Source order refers to the sales order from the order capture system. You cannot change a source order in Distributed Order Orchestration. Return fulfillment lines represent orders for product returns. A return fulfillment line is functionally similar to a fulfillment line, but it has a different set of attributes that are related to returns. You can search for Oracle Fusion Distributed Order Orchestration business objects on the Order Orchestration Overview page on the Order Orchestration work area. You can save searches that you want to run frequently and promote saved fulfillment line searches to the Watchlist for quick access. Basic search: Search for fulfillment lines, orchestration orders, orchestration order lines, orchestration processes, return fulfillment lines, order orchestration messages using a few attributes. Advanced search: Contains a greater variety of attributes that you can search on. In addition to the attributes that are displayed in the Advanced search area, you can find more, including extensible flexfields, in the Add Fields list. When you search on an attribute from the Add Fields list the attribute appears as a column in the Search Results region after the search is performed. You can use extensible flexfields when searching for fulfillment lines only. All segments in the context are displayed by default. Using the Advanced search option, you can also search for closed fulfillment lines. The basic search doesn't provide this option. One way to manage orders is to edit fulfillment line attributes in the Order Orchestration work area. The following scenarios illustrate when changing fulfillment line attributes is advantageous in facilitating order fulfillment. You are an order manager at a company that supplies carpeting from various warehouses throughout the United States. You just found out that the Boston warehouse is flooded due to a recent storm, but you know that the Dallas warehouse has ample supply. You search for all fulfillment lines that are sourcing the carpet from the Boston warehouse. You select all the fulfillment lines and open the Edit Fulfillment Lines window. You change the warehouse to Dallas. You are an order manager at a company that has been trying to renew the approved supplier status with Corporation ABC. The negotiators at this corporation have stated that they are considering not renewing the approved supplier status due to a number of late orders recently. Because of the importance of this contract, you want to ensure that the corporation's orders are not late. You search for all fulfillment lines for Corporation ABC. You select all the fulfillment lines and open the Edit Fulfillment Lines window. In the Demand Class list of values you select High Priority. The tasks of fulfillment lines within a group can be processed simultaneously. In parallel processing, the application can process simultaneously tasks of the same fulfillment lines or of different filtered fulfillment lines. You may want to use parallel processing when you have several fulfillment lines within a group that require some different processing tasks. For example, consider the purchase of a laptop computer with a service contract. The laptop is shipped, but the service contract is drafted and sent by e-mail. Order administrators can set up parallel processing on the Manage Orchestration Process Definition pages. Use parallel processing when you have long-running tasks that you want to run at the same time. For example, you want to send simultaneous requests to two different fulfillment systems that generally take some time to respond. Avoid parallel processing for tasks in which a response to the request is almost immediate. The following figure shows a partial orchestration process with parallel branches. The first two steps (Step 100 - Schedule Merchandise and Step 200 - Create Reservation) begin the orchestration process. A parallel node follows and then the two parallel branches begin. Steps 400 and 500 are in one branch, and steps 600 and 700 are in a parallel branch. The Create Invoice and Wait for Billing steps occur after the merge step. These final steps are not shown. Planning is run after each task is completed. However, consider that some tasks could take several days. Be aware that your planning data will not be up to date as the orchestration process waits for a long-running task to be completed before the branch is replanned. If you need more accurate planning data, then schedule your Plan Orchestration Processes scheduled process, which replans the entire orchestration process, to run more often. For example, you might want to schedule the planning scheduled process to run daily. You can't split a task that is in a parallel branch. If you or a user of a fulfillment system tries to split a task that is in a parallel branch, then the action will be rejected automatically. You can view tax information at the fulfillment line level. The tax information from the sales order is listed automatically on the associated fulfillment line when the sales order enters Oracle Fusion Distributed Order Orchestration. During processing, the tax information is transferred to downstream fulfillment systems. Those systems can make updates and send the information back to Distributed Order Orchestration. You cannot change tax information in Distributed Order Orchestration, but be aware that certain actions in Distributed Order Orchestration could result in a change to the tax information that you see. For example, if you split a line manually or it splits automatically, then a new warehouse and its associated information may be listed automatically. That warehouse may be associated with different tax information than the previous warehouse. An order administrator can create processing constraints using tax attributes and designate a tax attribute as an order attribute that identifies change (change attribute). Order processing is automated. In most cases, orders are processed to completion without errors. However, some errors might occur. You can identify errors in the various Order Orchestration pages. The Manage Order Orchestration Messages page groups messages about a fulfillment line in one location. If you possess the error recovery manager role, then you can correct these errors. Fulfillment lines in an order are not assigned to an orchestration process. An orchestration process did not start, or an orchestration process or task resulted in an error. An error occurred during internal processing of an orchestration process step. An error occurred when sending a task request to a fulfillment system. Assign Lines to Process: Use this action when an orchestration process was not assigned to the fulfillment lines of an order. This action attempts to assign fulfillment lines to an orchestration process. Recover Order: Use this action to correct errors, such as an orchestration process that has not started or an orchestration process or task that resulted in error. You must correct the root cause of the error before you use this action. This action is available only when an error is associated with an orchestration order. You can simultaneously select one or more orders for recovery. This action attempts to recover any orchestration processes or tasks that are in an error state for the orders that you select. It reruns the order from immediately before the point where the error occurred. Recover Process: Use this action to correct errors, such as an error in internal processing of an orchestration process step or an error in sending a task request to a fulfillment system. You can select one or more orchestration processes for recovery. The action attempts to recover any internal errors or tasks that are in an error state for the selected processes. You can use Recover Process to recover all the tasks that a process contains. It reruns the process from immediately before the point where the error occurred. Recover Task: Use this action to correct an error that results from an attempt to send a request to a fulfillment system. The action is available only when an outbound request fails. To simultaneously select multiple tasks for recovery, select multiple orchestration processes or orchestration orders, and then use Recover Process or Recover Order. It reruns the task from immediately before the point where the error occurred. An error that occurs in a source order that fail during decomposition. To correct this error, you must resubmit the order. An error that occurs during processing of a reply from a fulfillment system. To correct this error, you must resubmit the reply. In the Order Orchestration work area, you can expedite the fulfillment of orders in several ways. One way is to source items that are not available in one warehouse from a different warehouse. If you know that another warehouse has the item and quantity that the fulfillment line requires, then you can change the warehouse manually in the Edit Fulfillment Lines window. You must find out which warehouse has the item, by consulting the analytics, the Check Availability page, the Supply Availability report, or the Supply Allocations report; or outside the application. If the currently selected warehouse contains only some of the quantity that the fulfillment line requires, then you can manually split the fulfillment line and select another warehouse to source the remainder of the quantity. For example, fulfillment line 1 requires 30 widgets. The fulfillment line is in jeopardy because the currently selected warehouse, Warehouse A, has only 20 widgets. You split the fulfillment line and designate that the second fulfillment line source the remaining 10 widgets from Warehouse B. Order promising provides a variety of options for scheduling. The options may include sourcing the item from a different warehouse. To focus on options for sourcing from a different warehouse, clear the Warehouse attribute on the Check Availability page. Order promising recommends a warehouse based on the defined sourcing rules and warehouse rankings. Consult the Check Availability page for the options. Many orders are fulfilled automatically, but at times issues arise during the fulfillment process. Use the Order Orchestration work area to view the reasons and fix the exceptions. The Manage Fulfillment Line Exceptions page categorizes exceptions as: Past Due, In Jeopardy, Backordered, or On Hold. Past due indicates that the current date is later than the scheduled ship date. Most exceptions are related to item availability or an orchestration process task. You might have more than one way to resolve an exception; how you resolve exceptions depends on your organization's practices and priorities. Most fulfillment line exceptions are related to item availability. Consider the various options for resolving exceptions. Releases a hold on a fulfillment line. You can release a hold that was applied in Oracle Fusion Distributed Order Orchestration only. If a fulfillment line has a hold on some part of it, then it may be unable to proceed through the fulfillment process. A hold that is specific to some part of the orchestration process can allow a fulfillment line to proceed but may arrive at a point at which it will stop and wait for a user to release it. When you select Check Availability, a variety of scheduling options is presented to you with the best option clearly marked. The best option is determined by a set of business rules that the order administrator defines during implementation. If the fulfillment line already is scheduled and your selection results in a changed scheduled ship date, then change processing is triggered. This is the most effective way to reschedule a fulfillment line because it optimizes choices and provides you with all the information that you need to evaluate trade-offs. You do not have information about supply other than what appears on the Order Orchestration work area. Overrides the scheduled ship date or scheduled arrival date assigned by the order promising process. If you change the scheduled ship date after the fulfillment line is scheduled, then change processing is triggered. You are aware of an alternative to the schedule assigned by the order promising process, and you know the best date to schedule the fulfillment line. You can override the schedule of multiple fulfillment lines. Lets you change the warehouse that sources the item on the selected fulfillment lines. You know the warehouse from which you want to source the item. The analytics provide information that may help you determine the warehouse to choose. Determines priority when scheduling the fulfillment line. You want to schedule fulfillment lines as a group and ensure that important customers get the supply first. You want to expedite fulfillment, but the exact date is not important to you. You can change the demand class of multiple fulfillment lines. Lets you change the shipping method for all the selected fulfillment lines to a more expeditious method. You know the shipping method that you want to use. You can change the shipping method of multiple fulfillment lines. Gives the order promising process the freedom to choose the best fulfillment option, without regard to a specific attribute. You want to use Check Availability to search for the best possible fulfillment options, without having to consider some fulfillment requirements. You can clear the attributes of multiple fulfillment lines. Substitutes the item on the fulfillment line with an item that you choose. Distributed Order Orchestration presents the best substitution based on rules in the item master. You see that an allowable substitute will provide you with a better scheduling option. The analytics provide information that may help you determine the item to substitute. Splits the selected fulfillment line into two or more fulfillment lines. You know that you can fulfill part of the fulfillment line from one warehouse and part from another warehouse. The analytics provide information that may help you determine the warehouse to source from. Releases supply so that it is available for another fulfillment line. It invokes change management which brings the process back to the scheduling step and in Awaiting Scheduling status. You want to release supply to make it available for a high-priority fulfillment line. You want to reschedule a fulfillment line from the Order Orchestration work area. Makes an initial request to the order promising process to schedule a fulfillment line. The fulfillment line is associated with an orchestration process that has a manual scheduling step, or the fulfillment line was unscheduled. Releases supply that is earmarked for a specific fulfillment line, so that it is available for another fulfillment line. You want to release supply reserved for a specific line to make it available for a high-priority fulfillment line. Removes supply from availability and earmarks it for a specific fulfillment line. You want to ensure that supply is allocated for a particular fulfillment line. Holds prevent an orchestration process from proceeding. You can apply holds to current or future tasks. Holds can come from Oracle Fusion Distributed Order Orchestration or from order capture systems. You can apply holds to orchestration orders, orchestration order lines, and fulfillment lines in the Order Orchestration work area. Holds occur automatically when a change from the Order Orchestration work area or the order capture application requires change management to compensate the orchestration process. In this case, a message to apply a hold is sent to the fulfillment system, so that the orchestration process stops while compensation occurs. A hold on an orchestration order carries over to the fulfillment lines that map to the orchestration order. If a fulfillment line splits, then the hold is mapped to the new fulfillment line. If a hold is applied to one or more lines in a shipment set, then the hold applies to the entire shipment set. Distributed Order Orchestration users can release holds that were applied by a Distributed Order Orchestration user only. The Hold Source System attribute indicates where the hold was applied. If a hold was placed on an orchestration order, then you cannot release the hold on the corresponding lines independently. You must release the hold on the orchestration order. While compensation for a change is occurring, holds are released automatically after all the steps are undone. External systems, such as an order capture application, also can release a hold automatically by sending a message to release a hold that was applied in the external system. An active hold is a current stop to an orchestration process. A fulfillment line could have a hold on the associated orchestration process, but it continues to be processed because it has not yet reached the step that has the hold. Although a fulfillment line may not have an active hold, it still appears as on hold in the Order Orchestration work area if the line has an unreleased hold. Errors can come from a variety of modules in Oracle Fusion Distributed Order Orchestration or from an integrated system, such as a billing system. Distributed Order Orchestration captures and reports the order orchestration exceptions, so that you can view exception details and history and address the issues properly and promptly. You can view the exceptions on the Manage Order Orchestration Messages window in the Order Orchestration work area. Use these scenarios to understand how to use orchestration messages to resolve issues. You are an order manager at a company that manufactures self-cleaning toilets. You see an orchestration order in Distributed Order Orchestration for 100 toilets. The associated fulfillment line was scheduled and reservation was confirmed. The orchestration process sent a shipment request to the shipping system. The customer asks the sales representative to hold the shipment, due to a fire in its warehouse. The sales representative applies a hold on the order and sends the hold request to Distributed Order Orchestration. The hold cannot be honored by the shipping system because the order already was picked and released. A warning is sent from the shipping system to Distributed Order Orchestration, and the hold request is rejected. The sales representative phones you to discuss the rejected hold request. You see the details in the Manage Order Orchestration Messages window and explain the reason for the hold rejection. You are an order manager at a company that manufactures grade A pipes. A customer orders 100 pipes, and an orchestration order is created in Distributed Order Orchestration. A few days after Distributed Order Orchestration sent the shipment request to the shipping system, the customer calls to change the order quantity. The sales representative modifies the sales order and sends the change order to Distributed Order Orchestration. Because the order already was shipped, the change order is rejected. The error details are saved. You view the details in the Manage Order Orchestration Messages window and explain to the sales representative the reason for the rejection. You are an order manager at a company that provides digital network service. A sales order was received by Distributed Order Orchestration, but an orchestration process was not assigned to the corresponding orchestration order, due to missing process selection rules. You see the exception in the Manage Order Orchestration Messages window. You see that multiple orders are affected by the same error. You notify an order administrator, who adds the necessary process selection rules. Afterwards, the order administrator, using the Error Recovery privilege, activates the assign and launch process. As a result, orchestration processes are assigned to the orchestration orders. 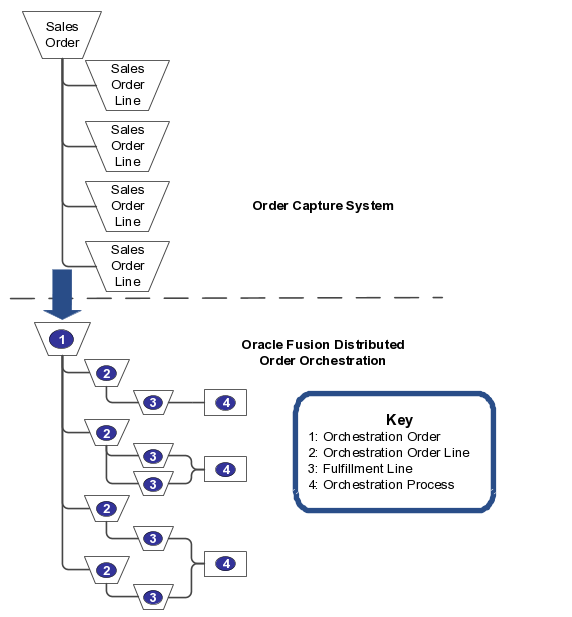 In most cases, scheduling of a fulfillment line occurs automatically when an orchestration process is assigned to the fulfillment line after a sales order enters Oracle Fusion Distributed Order Orchestration. If a fulfillment line is on a manual scheduling step, then you can schedule the line manually in the Order Orchestration work area. Select one or more fulfillment lines at the same time and schedule them from a table of fulfillment lines. The fulfillment lines are scheduled in order of the Requested Ship Date or Requested Arrival Date attribute. Select one or more fulfillment lines and schedule them by selecting a scheduling option on the Check Availability page. Order promising does not calculate options when you select the Override Schedule option. Unscheduling releases supply, so that it is available for another fulfillment line. This action leaves the fulfillment line in a state where it is awaiting scheduling. You might want to unschedule supply when you want to release supply to make it available for a high-priority fulfillment line. The manual scheduling options apply to configured items, models, and shipment sets. If you select just one fulfillment line in one of these groupings, then the scheduling option that you select applies to all of the fulfillment lines. Use the analytics in the Order Orchestration work area to understand the status of orders and to help you determine the best way to facilitate fulfillment. To understand the analytics thoroughly, it is important to know how they are calculated. The Overview reports provide a high-level view of the status of fulfillment lines. The Fulfillment Lines by Exception report shows open fulfillment lines, each of which may have multiple concurrent exception types. That means that a fulfillment line could be counted more than once. For example, a fulfillment line could be both in jeopardy and on hold. In the Fulfillment Lines by Exception report, this line is counted once in the count of lines that have a jeopardy exception and once in the count of lines that are on hold. The Fulfillment Lines by Status report counts open fulfillment lines only. The On-Time Shipment Percentage by Time report shows the percentage of orders where all fulfillment lines were shipped on time. The Manage Fulfillment Line Exceptions reports provide information about items, customers, and orders for the selected fulfillment line. Analytics about customers use the customer party ID for the query. The Item Availability report shows information about the item that is associated with the selected fulfillment line. Available quantity: Amount of unallocated inventory available that is used to fill customer orders. It is calculated as the shelf quantity minus the allocated quantity. Shelf quantity: Amount of inventory that is on the shelf for a given item that is currently in the warehouse. It includes both allocated and unallocated quantities. Allocated quantity: Amount of inventory that was set aside to fill a customer's order. Count of Holds for This Item by Hold Name counts holds applied to the orchestration order, orchestration order line, and associated fulfillment lines. The analytic is based on the selected record in the master table. A given fulfillment line may have multiple different holds. This report is cached, so the data is not real-time. The data is refreshed in accordance with the caching configuration. Order Age by Time is calculated as follows: [(system date) - (ordered date for open orders)] / [(last updated date) - (ordered date for closed orders)]. Last updated date serves as a proxy for closed date. If an order is future dated, then it is possible to get a negative value. The Time axis is based on ordered date, meaning an order placed in May but closed in June appears on the May graph bar. The Order Value by Time shows the value in the standardized currency. The standardized currency is the currency that is used in the Order Orchestration work area. It might not be the currency of the original transaction. Open Orchestration Orders for This Customer by Age is calculated the same way as Order Age by Time, except Open Orchestration Orders for This Customer by Age shows only open orders for the selected record in the master table. Negative values are possible. The Count of Holds for This Customer by Hold Name report is calculated the same way as the Count of Holds for This Item by Hold Name report. The Value of Fulfillment Lines by Hold Type report shows the value in the standardized currency. The standardized currency is the currency that is used in the Order Orchestration work area. It might not be the currency of the original transaction. This report does not count the same hold more than once, in the case of inherited holds. For example, a hold code that is applied to an orchestration order is inherited by the associated fulfillment line, but the hold is counted only once in the report. Average Age of Orders by Hold is calculated the same way as Order Age by Time. This report counts holds that are applied to an orchestration order; it does not count holds that are applied to associated fulfillment lines. The Manage Orchestration Process Exceptions reports provide current and historical information about orchestration processes. An orchestration process can have more than one exception. In the Orchestration Process Exceptions by Type report, each orchestration process is counted once for each of the exceptions that applies to it. The Average Process Duration by Time report compares all closed orchestration process instances with the same name historically against the current selected orchestration process. The Count of Holds for This Customer by Hold Name report that appears on the Manage Orchestration Process Exceptions page counts orchestration processes that are associated with the selected customer in which a current task is stopped due to a hold. The On-Time Shipment Percentage by Time report shows the percentage of orders where all fulfillment lines were shipped on time for the customer of the selected orchestration process. The Orchestration Orders by Time report is filtered based on the customer in the selected orchestration process. The Order Orchestration work area analytics use several underlying technologies. You might need to know the technology of a report to troubleshoot issues with it. The following table lists the types of reports in the Order Orchestration work area and the underlying technology of each. Splitting a fulfillment line is one of several ways to fulfill an orchestration order. You might want to split a fulfillment line if it is delayed because the full requested quantity is not available in the original warehouse. If you check the availability of the item in the analytics and find another warehouse that has enough of the item to fulfill the order, then you can split the fulfillment line. Each fulfillment line sources part of the total desired quantity from a different warehouse. When a fulfillment line splits, the entire orchestration process splits also. In the Order Orchestration work area, you can split fulfillment lines using the Split Fulfillment Line action only on a manual schedule task. Change management is not triggered for manual splits. You can't explicitly split a fulfillment line manually from the Check Availability page. The availability option you select, however, may implicitly split the fulfillment line. If you want to split a fulfillment line that is not on a manual schedule task, then you can click the Unschedule button while an orchestration process is running. This action takes the orchestration process back to the schedule task, which now is manual. Then you can split the fulfillment line. Fulfillment lines can be split automatically in several cases. If you select a fulfillment option on the Check Availability page, then the option might require a fulfillment line to be split to achieve the results that you want. Other fulfillment systems also can automatically split fulfillment lines. Not all fulfillment lines can be split. Only fulfillment lines with the Splits Allowed attribute and which have a quantity greater than one can be split. A split can be prohibited on any fulfillment line. An option is available to override the prohibition, but you must have the override privilege. Even if a fulfillment line can be split as indicated previously, you can't split a fulfillment line if it is on a task in a parallel branch. You can't split fulfillment lines within shipment sets. You can split a line within a shipment set only if you remove the line from the shipment set before splitting, creating an independent fulfillment line. When a fulfillment line has an attachment, the fulfillment lines that result from the split inherit the attachment. View the original ordered quantity on the orchestration order line. You can see the quantity on each fulfillment line after the split on the Manage Fulfillment Lines page. On the Order Orchestration work area, some fulfillment line actions are disabled under certain circumstances. This table lists actions in the Order Orchestration work area and the conditions under which they are disabled. User request status is processing. The fulfillment line is locked. The fulfillment line is canceled. The fulfillment line is closed. The fulfillment line was shipped. An orchestration process was not assigned. The fulfillment line belongs to a model. The fulfillment line is not scheduled. Scheduled ship date is null. The fulfillment line or any associated child fulfillment line already was reserved. Reserved quantity is not null. A child fulfillment line is reserved. Neither the fulfillment line nor any associated child fulfillment line was reserved. Reserved quantity is null. Multiple fulfillment lines are selected, and not all are for the same ordered item. When an ordered item already has been substituted, the original item is used to determine whether all the items are the same. The fulfillment line does not allow for substitution (Substitute Allowed = False), and you do not have the privilege to override the restriction. The fulfillment line is a model. The fulfillment line belongs to a shipment set. The fulfillment line is not on hold. The fulfillment line does not allow for partial shipment (Split Allowed = False) and the user does not have the privilege to override. More than one fulfillment line is selected. A model is a fulfillment line that has child fulfillment lines. An example of a model is a desktop computer, which is bundled with a monitor, keyboard, mouse, and external speakers. The desktop computer is the model; the peripherals are the child fulfillment lines. In the Order Orchestration work area, the model appears with its child fulfillment lines collapsed. To see the child fulfillment lines, expand the model. Models can be scheduled automatically, like any other fulfillment line. Only a complete model can be scheduled. All the fulfillment lines that belong to a shipment set or a model will be assigned to the same orchestration process. Splits are allowed at the model level only. Splits are cascaded to the child fulfillment lines proportionally. Models are treated as a single unit, and the hold is applied at all levels. Shippable fulfillment lines in a model are sent to the shipping system together. A model is treated as a shipment set for shipping purposes. Proportional split: A shipped model and an unshipped model. Non-proportional split: A model remnant, which is a partially fulfilled model with a broken model structure. For partial receipts, model group is split into two orchestration groups, one group that has received fulfillment lines (which will move to invoicing) and the other group that has nonreturnable fulfillment lines and unreceived fulfillment lines. Fulfillment lines in a model are sent to the billing system together. Orchestration orders and orchestration order lines remain open after they are fulfilled until they are closed by a scheduled process. The statuses of the orchestration orders and orchestration order lines are updated after the scheduled process closes them. This functionality gives you more control over determining when your organization considers its orders closed. The scheduled process closes all eligible lines and then closes the order if the order entity is chosen as the parameter. You create your closure requests on the Overview page of the Scheduled Processes work area. Click the Schedule New Process tab, select the Update or Close Orchestration Orders process, and create a new request. Required field. Enter Header for orchestration order and Line for orchestration order line. If you do not enter a start date, end date, or interval hours, then you must enter an entity ID. You can run a query to obtain the entity ID. Earliest creation date and time of the entity. If you enter interval hours, then do not enter a start date. Latest creation date and time of the entity. If you enter interval hours, then do not enter an end date. Period of time in hours counted backwards from the time when the process is initiated. It is used to determine the earliest and latest creation date and time of the entity. The latest creation date and time is the date and the time when the process is initiated. For example, if the process is scheduled to start at 4 PM tomorrow, then the latest creation date and time is 4 PM tomorrow. The earliest creation date and time is the latest creation date and time minus the interval hours. If you enter 4 as the interval hours and the process is scheduled to start at 4 PM tomorrow, then the earliest creation date and time is 12 PM tomorrow. A fulfillment line is considered closed when all steps of the assigned orchestration process have been completed. You may see an indication that fulfillment is complete at one of the steps of the orchestration process, such as shipping complete. However, this indicator simply means that your organization considers fulfillment complete when the process reaches this step. The fulfillment line is not actually closed at this point, though. Note that orchestration orders and orchestration order lines may appear open even when all associated fulfillment lines are closed, if the Update or Close Orchestration Orders scheduled process wasn't run since fulfillment line closure. You can set up the scheduled process in the Scheduled Processes work area. What happens if I change a fulfillment line? A change to a fulfillment line almost always results in a change to the associated orchestration process. Changes include manual and automatic changes, such as change orders, edits to fulfillment line attributes, and rescheduling. Oracle Fusion Distributed Order Orchestration automatically evaluates changes and determines the adjustments that must be made to accommodate them. Why can't I edit some attributes? Your organization might be using processing constraints to prohibit changes to some attributes. Processing constraints control who can change an order, what types of changes can be made, and when changes can be made. How can I search for closed fulfillment lines? Search for closed fulfillment lines and return fulfillment lines using an advanced search.